There are two special periods during which we honor the deceased in Japan. They are known as "obon" and "higan". "Higan" begins three days before the spring and autumn equinox and ends three days after it. "Higan" also refers to "the other world," or the state of enlightenment, in Buddhism. During "obon" (usually August 13th-16th), the spirits of the deceased are said to return to "this world". People welcome their ancestors' spirits, entertain them, and see them off. On the other hand, during "higan", people living in this world try to come close to "the other world". 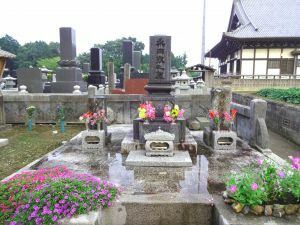 The Japanese visit ancestors' graves to recall and thank the deceased, and also to think about "the other world" where everyone goes in due time. The most popular flowers offered at graves are chrysanthemums. There are five major reasons. Second, there is a wide variety of chrysanthemums. Third, it is believed that the flowers have the power to ward off evil. Fourth, they represent nobility and the sublime in the language of floweres. Fifth, a chrysanthemum is the family crest of the Imperial Family of Japan. 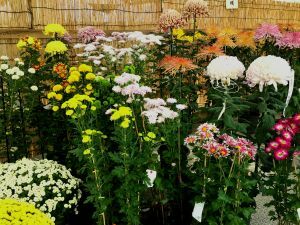 In Japan, chrysanthemums are strongly associated with graves and the deceased, so be sure that you never give a chrysanthemum to your friends or partner!